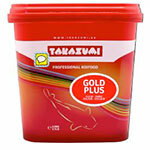 Takazumi Gold Plus is a complete, well-balanced, professional Koi feed with all the nutrition for a healthy Koi life, prosperous growth and an amazing colouration. This high quality nutrition does not make the water cloudy. The high digestibility adds to a considerable decrease of the load on the filter system and a better water quality. The pellets float for a long time, which provides a clear view of the feeding behaviour and minimizes the detrimental results of excessive feeding. Astaxanthin enhances the Kois pigmentation, showing its colours to full advantage. Do not feed Takazumi Gold Plus at water temperatures below 4°C. Takazumi High Growth is a complete, well-balanced, professional Koi feed with a high protein content and an amino acid profile that enables excellent growth. It contains all the necessary nutrition for a healthy Koi life. Carefully selected raw materials guarantee a high quality nutrition that does not make the water cloudy. The high digestibility adds to a considerable decrease of the load on the filter system and a better water quality. The pellets float for a long time, which makes the feeding behaviour clear and controllable. Feed only at water temperatures of 15°C and above. Takazumi Mix is a complete, well-balanced, professional Koi feed with all the nutrition for a healthy Koi life, optimum fast growth and intensive colouration. 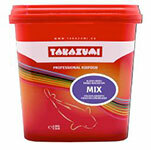 Takazumi Mix is a high quality nutrition that does not make the water cloudy. Due to the combination of two top feeds  GoldPlus and High Growth  your Koi will develop a superb colouration and prosperous growth. Astaxanthin enhances the Kois pigmentation, showing its colours to full advantage. 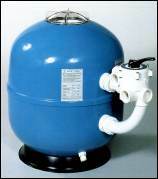 The high digestibility adds to a considerable decrease of the load on the filter system and a better water quality. The pellets are floating, which provides a clear and manageable feeding behaviour. Feed only at water temperatures of 10°C and above. Takazumi Vital is a complete, well-balanced, professional Koi feed with all the nutrition for a healthy Koi life and a special premix. This premix is a cocktail of various ingredients to stimulate your Kois immune system and thus builds up an excellent defence to infections and parasites. Takazumi Vital is outstanding for use when your Kois condition declines, for instance after treatment with medicine or after transport. 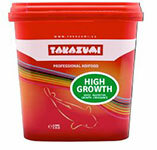 Feeding Takazumi Vital for 2 to 3 weeks will suffice in these cases  and is also very adequate for use as a Winter feed. By feeding this food from late Autumn to early Spring, you protect your Kois health. The quality of the crude materials and the high digestibility add to a considerable decrease in the load on the filter and helps to achieve better water quality. Feed only at water temperatures of 4°C and above. 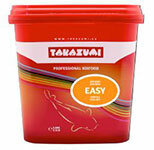 Takazumi Easy is a balanced, professional and complete basic feed with all the nutrition a Koi needs for a healthy life. Takazumi Easy is a sinking food, intended to accommodate the less active  easy  Koi that withdraws from pursuing the pellets once added to the water, instead waiting for the pellets to fall to the deeper parts of the pond. Takazumi Easy can be fed the whole year through. Thanks to its sinking characteristics and the low fat, medium protein content it is also very adequately applicable as a winter feed. Dosed feeding prevents cloudy water. Copper Sulphate = 5.0 mg/kg. Takazumi Junior Premium is a complete, professional breeding feed for juvenile Koi with a body weight of 1.5 to 5 grams (5 to 10cm in length) that was developed for the professional breeder. This extruded granulate contains quality ingredients, along with a combination of vitamins, minerals and a very high percentage of easily digestible proteins. All of these ingredients enable Takazumi Junior Premium food to guarantee fast and optimum growth of juvenile Koi. Furthermore, feeding Junior Premium improves survival rates in the early stage of the Kois life. It is recommended to feed at a water temperatures above 10°C. Vitamin B1, B2, B5, B12, K3, H (biotin) and choline, Copper Sulphate = 30.0 mg/kg. Takazumi Yugen is a complete Koi food with additional bacterial immunomodulator having a matchless effect on the Kois immune system. In young and growing as well as in mature Koi, feeding Yugen will result in a well-developed and optimally functioning immune system in a very short space of time. This results in outstanding growth, spectacular colouring and most of all in a strong improvement of the natural resistance. Feed Yugen instead of the ordinary feed 4 times a year for 5 consecutive days, with intervals of at least 2 months and certainly shortly before and shortly after the Winter period. Yugen represents subtlety with profound depth. Yugen is an application that originates from the lifelong search of Professor John and Mrs Cynthia Stanford for methods to reinforce the human and animal immune system. Yugen is co-produced by BioEos (GB) and Takazumi (NL). 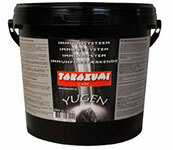 Takazumi Sturgeon is a complete, well-balanced professional Sturgeon feed with a high protein content and an amino acid profile that enables excellent growth. It contains all the necessary nutrition for a healthy Sturgeon life. The carefully selected raw materials guarantee a high-quality nutrition that does not make the water cloudy. The high digestibility of the Sturgeon pellets adds to a better water quality. The pellets are sinking, which makes them ideal for Sturgeon. Composition :-Vegetable and vegetable by-products produced with genetically modified Soya Cereals, fish products and by-products, vegetable protein extracts, minerials.